Do you like (Superhero!) vegetables? Update: I've just updated these vegetables to be "Superhero vegetables." Apparently just giving vegetables superhero powers and cool names gets the kids to eat more of them. So print out the posters, put them on the wall, and watch the obesity levels plummet! I never used to teach vegetables as the kids never seemed that excited by them. But things do seem to have changed in the last few years, everyone is into healthy eating, even elementary school kids! 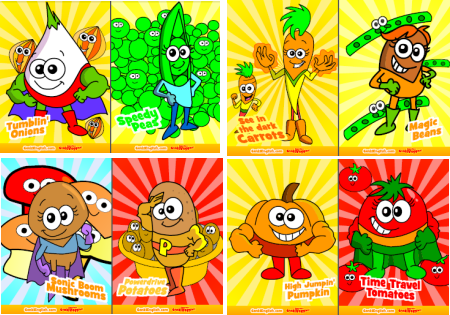 Research has shown that giving vegetables cool names gets kids to eat them more, so ... we've made them into superheroes! If you make them look cute, and make them into a funky song, the kids love them. All the items in the song are introduced in the plural form so it's easy to mix in with Do you like...?, I'd like some...? etc. There is also a bonus version of the track with the question "Do you like....?" instead of the simple "I like...". In any case I'd recommend the easier version first. For games, you can use any of the vocab practice games. 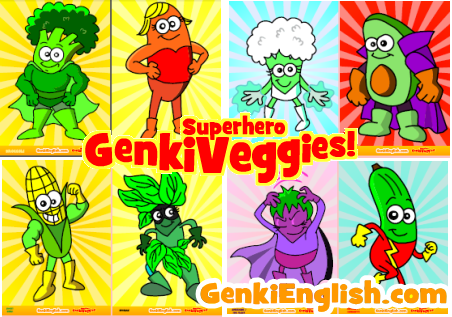 These superheroes aren't in the song, but are perfect for a "Veggie of the Day" poster for school lunch. Class Game: Superhero Superpower Smoothies! Try this fantastic game from Dacha in France! There are also the online "I love vegetables" and "What's your favourite food?" picture books for this theme.